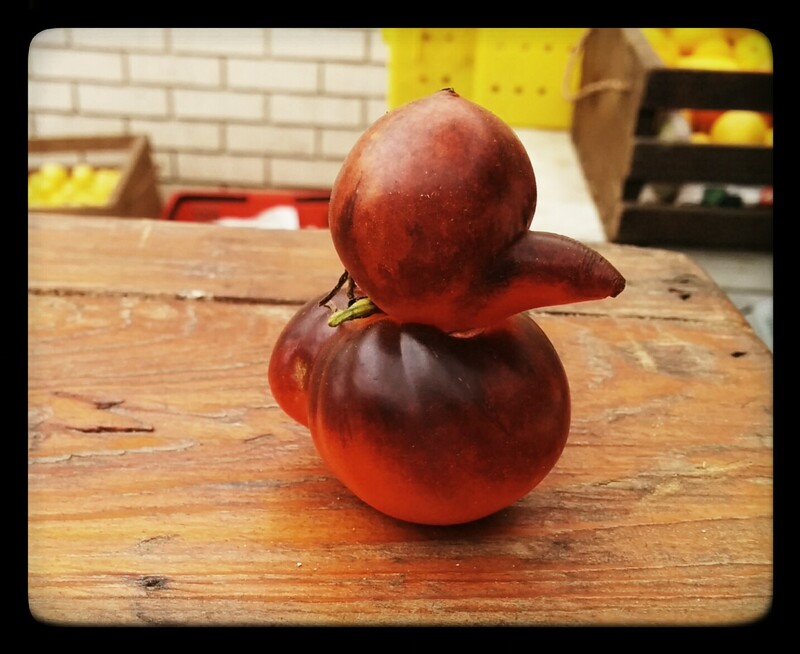 An unusual duck-shaped tomato at my local farmer’s market. I think this will make a great marinara for my daughter. This whole venture came about because of her. Ever since she was a toddler, I’ve tried to get her to try to eat ravioli. Well, Hurricane Katrina happened about 2 weeks after her first birthday. For some reason, canned ravioli was against her taste buds. As were corn dogs, hamburgers, fish sticks, meatloaf, just about most anything that is served in daycare – all things Mommy doesn’t make!! But, every hurricane season I always buy one or two cans of ravioli (just in case! ), thinking that we can always eat them later, and I always end up giving them to my neighbors by November. Well, a few weeks ago, we were in the store, and I’m trying to entice my now 9 year old to try ravioli again! But this, time, I point out the “freshly-made” ravioli with the accompanying “fresh” marinara sauce. She walks over, looks at them, reads the labels, and says “Yes, I’ll try that!” I look at the price, and say “Ok, But, I’m going to teach you to cook it, so you can prepare your own meal.” And, she agreed! What, I’m thinking here, is down the road, just to get her to enjoy the ravioli, then, teach her to make her own ravioli! She enjoyed our potsticker endeavor, both the making and the eating, so, this should be a win-win. A week later, I picked up a canning summer publication by Better Homes and Gardens, and, inside, they had this recipe. Sold! It was perfect timing. The price of that “freshly-made” ravioli and sauce was $10, and she made 2 meals out of it. While I considered the canning adventure a little pricey since so many of the tomatoes came from the farmer’s market, I actually got almost double the pints that the recipe predicted, and the taste was almost as powerful as the $4.50 pint, at a fraction of the price. I hope it goes over well. If nothing else, she can make French bread pizza all during the school year. Most importantly, if you are going to process these in a water canner, do not deviate from the recipe. Do not add more olive oil, do not add onions, or more peppers. All of these things will change (lower) the pH of the sauce, leading to possible contamination. If you have a pressure canner, please follow the guidelines on the link below. 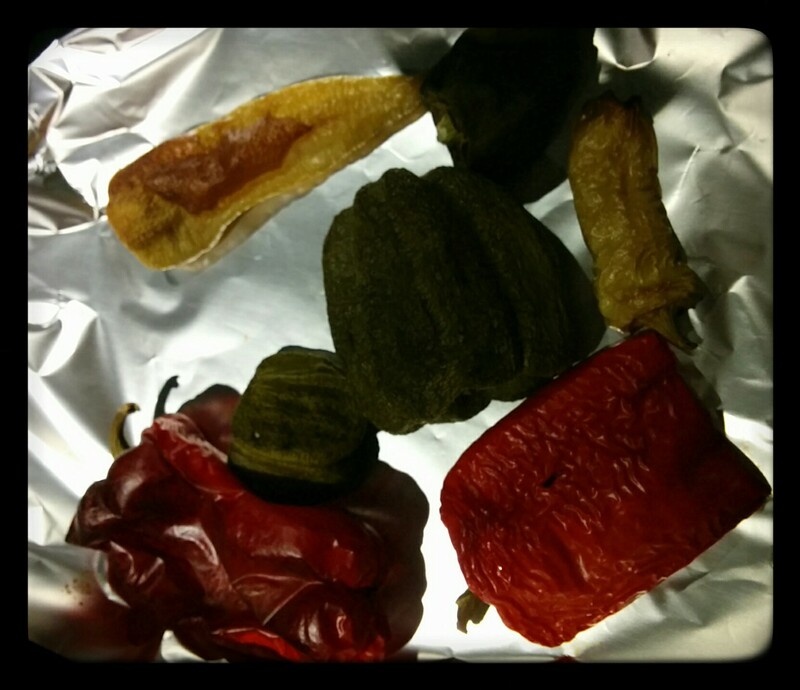 The peppers, roasted in the oven. 2. To roast the garlic and peppers, bake them or grill them for about 40 minutes or until the garlic feels soft and the peppers are charred. Cool garlic and peppers before handling, about 15 to 30 minutes. 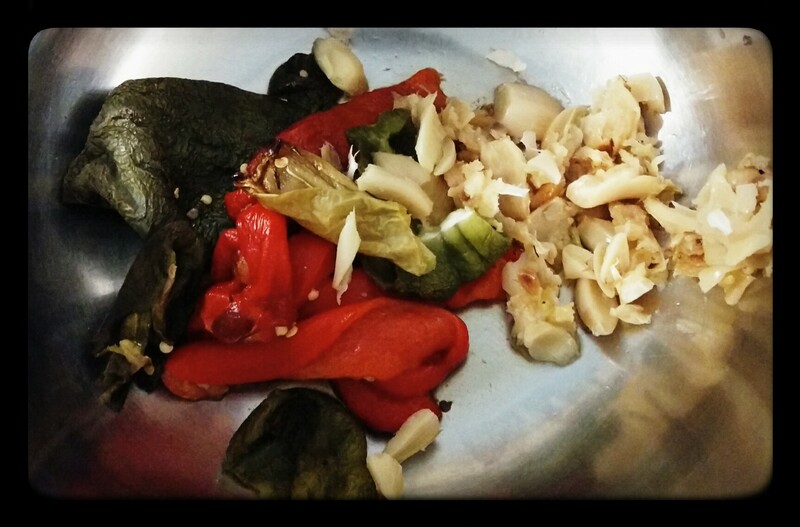 Peel and discard skins of garlic and peppers. Chop peppers (reserve any juice from the peppers that may collect; there is a lot of flavor in the juice); set aside. 3. Remove garlic cloves from paper skins by squeezing the bottoms of the bulbs. Place garlic cloves in a food processor. 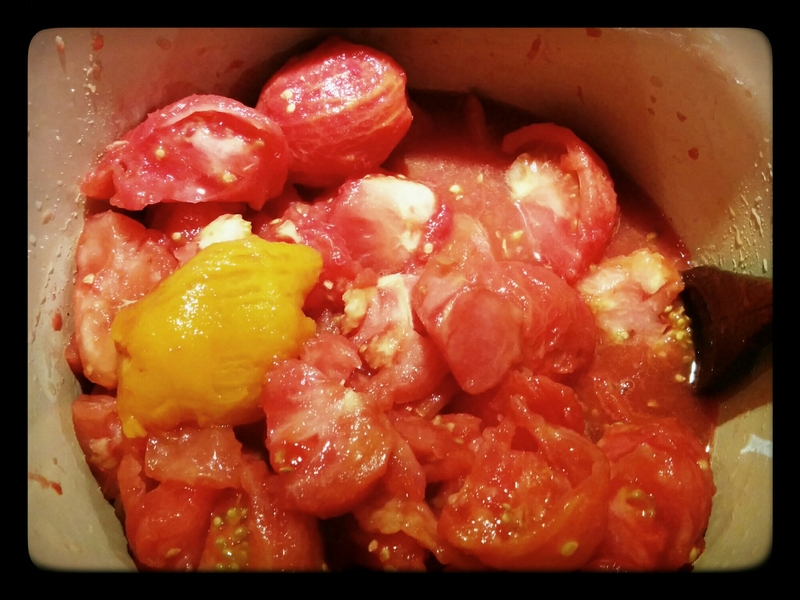 Cut peeled tomatoes into chunks; add some of the chunks to the garlic in food processor. Cover and process until chopped. The peeled and roasted garlic, and the peeled roasted peppers, ready to be processed. 4. Transfer chopped garlic and tomatoes to a 7 to 8-quart stainless-steel, enamel, or nonstick heavy pot. Working in batches, repeat chopping the remaining tomatoes in the food processor. Add all of the tomatoes to the pot. The peeled, and coarsely chopped tomatoes. Instead of using the food processor, I used an immersion blender. Little Bit looks a smoother sauce as opposed to a chunky sauce. 5. Add brown sugar, salt, vinegar, and black pepper to tomato mixture. Bring to a rolling boil. Boil steadily, uncovered, for 50 minutes, stirring frequently. Stir in chopped peppers. Boil for 10 to 20 minutes more or until mixture reaches desired consistency (you should have 11 cups), stirring occasionally. Remove from heat; stir in basil and assorted herbs. As the sauce starts to boil, it will foam a lot initially. As it continues to cook, this foam will subside. A lot of old recipes advise skimming this foam, but I see no reason to remove a single teaspoon of tomato goodness from the pot. 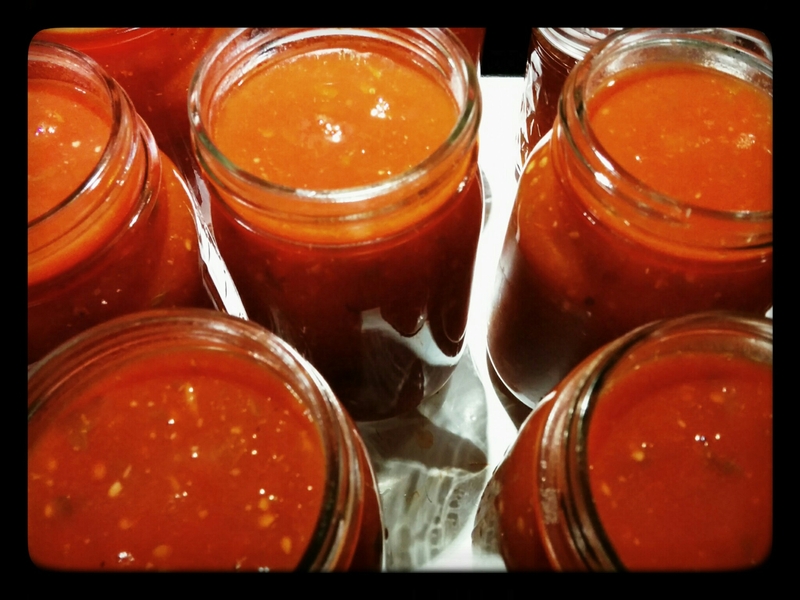 Filling the jars with the sauce…. 7. Process filled jars in a boiling-water canner for 35 minutes. Do not start timing until water returns to a boiling. Remove jars from canner, and let cool on wire racks overnight or for 24 hours undisturbed. Makes 6 pints. 8. Notes: The tomatoes I was able to purchase at the farmer’s market, and the Creole tomatoes I was able to purchase at the store, in addition to the tomatoes I was gifted by my neighbor’s for this endeavor only came up to 10 pounds. So, I added one 28-ounce can of Roma tomatoes to make up the last 2 pounds of tomatoes. I was also a little short of bell peppers, so I figured I would come out even. Boy was I wrong! I let the sauce cook for a good hour and a half, almost two; I thought it was plenty thick. It became obvious to me that I was going to have more than the predicted 6 pints of sauce. So, just in case, I had 11 pints ready and two half-pints. One pint cracked due to the cold lemon juice – one down! As the jars started to fill up, it became obvious that I would need each and every jar. I had 8 ounces left over. Thank goodness I had plenty of commercial lemon juice to help with the acidity and the preservation, and plenty of jars! Maybe since I was using heirloom and Creole tomatoes, as opposed to Roma tomatoes, I had plenty of juice in my sauce. But, it’s a fact that most of the flavor of tomatoes is around the seeds, so, I had no intention of removing the seeds and juice from these juicy and luscious tomatoes. Must keep all the tomato goodness!! Even though this recipe didn’t call for removing the seeds, most do. I’m still checking the original recipe to see if this step was originally included, but I have not found it. It did make a mighty fine sauce. I was happy to have a little bit leftover; it gave us something to sample. Make an X in the bottom of each tomato. Bring a large pot of water to a boil. 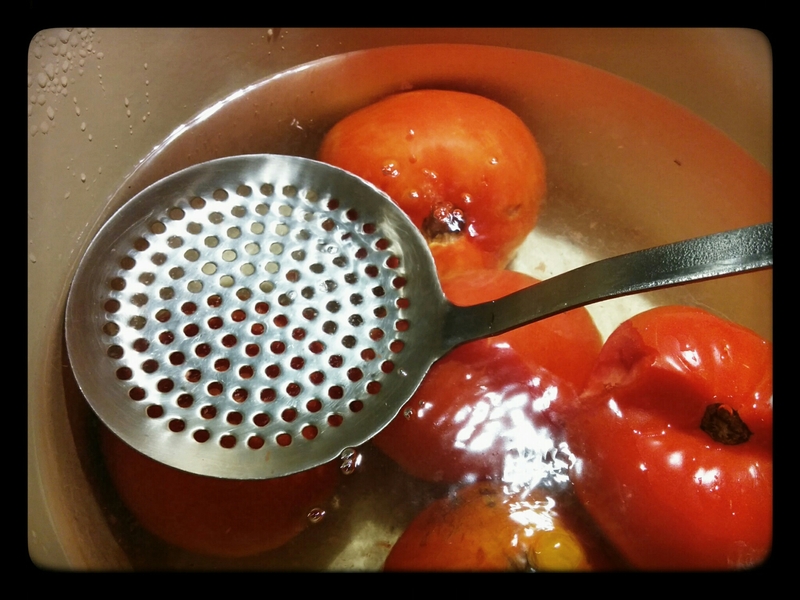 A spider or strainer of some sort is handy for scooping out the tomatoes. Immerse the tomatoes briefly for 30 to 60 seconds until the skin starts to peel or split. The goal is not to cook the tomatoes, simply to loosen the skin. 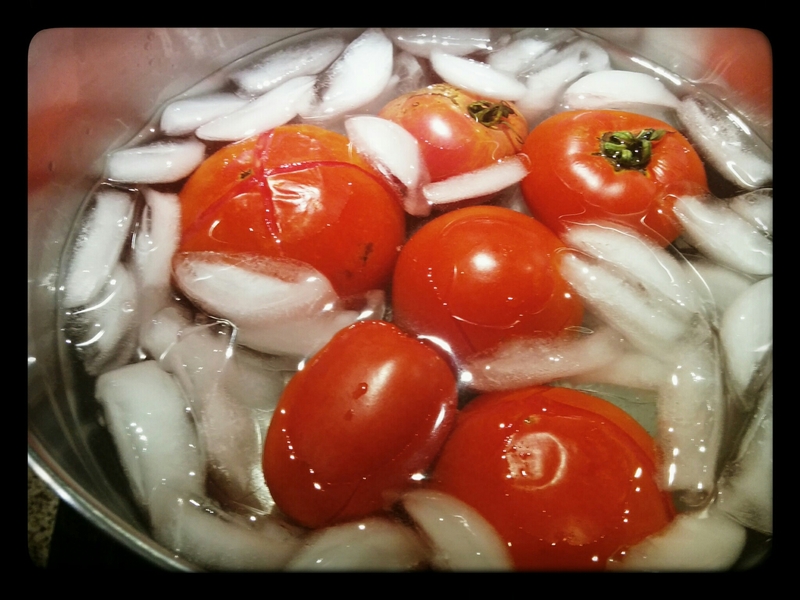 Immediately, transfer the tomatoes to a bowl of icy cold water. Let cool down, then transfer back to working trays until all tomatoes are complete. 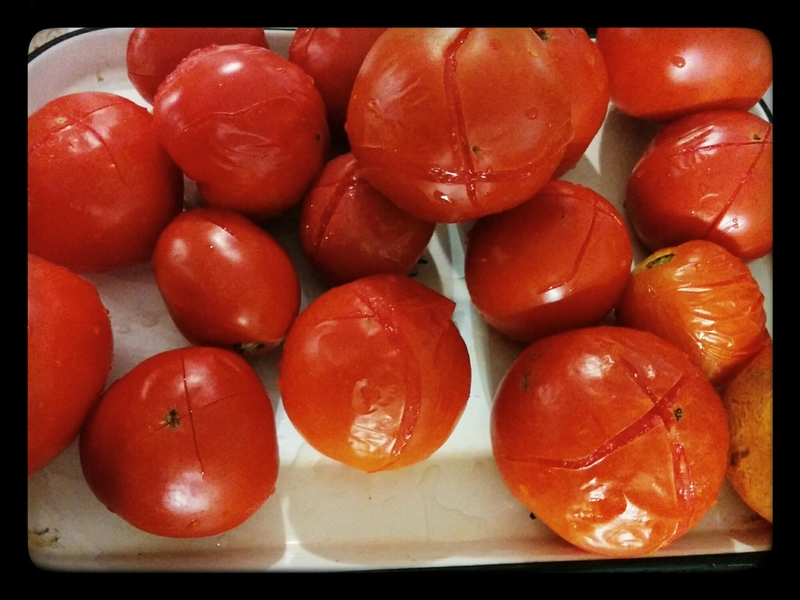 The blistered tomatoes, skins loosened, very easy to peel. Peel the tomatoes and discard the skins. Coarsely chop the tomatoes and either process in a blender, a food processor, or use an immersion blender. Great post! 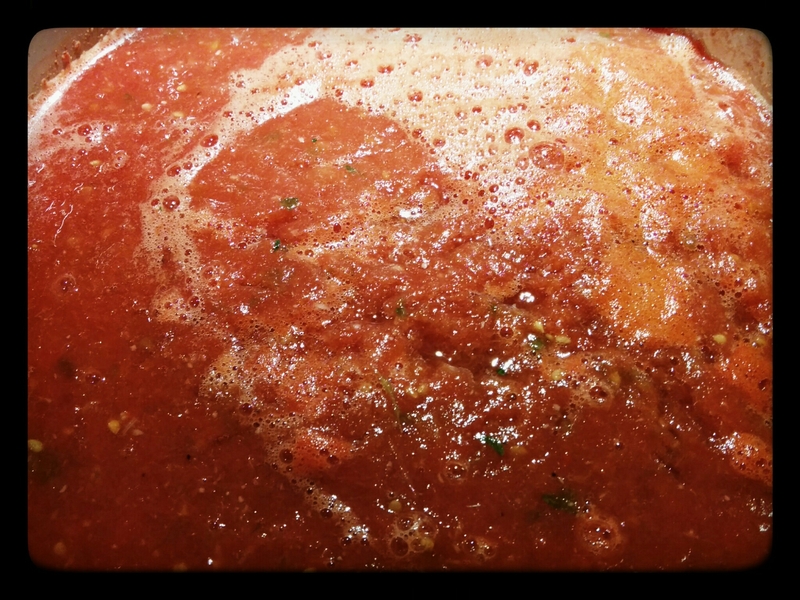 I’ve done many adventures in the tomato canning world, but haven’t tried a marinara sauce yet. Thanks! 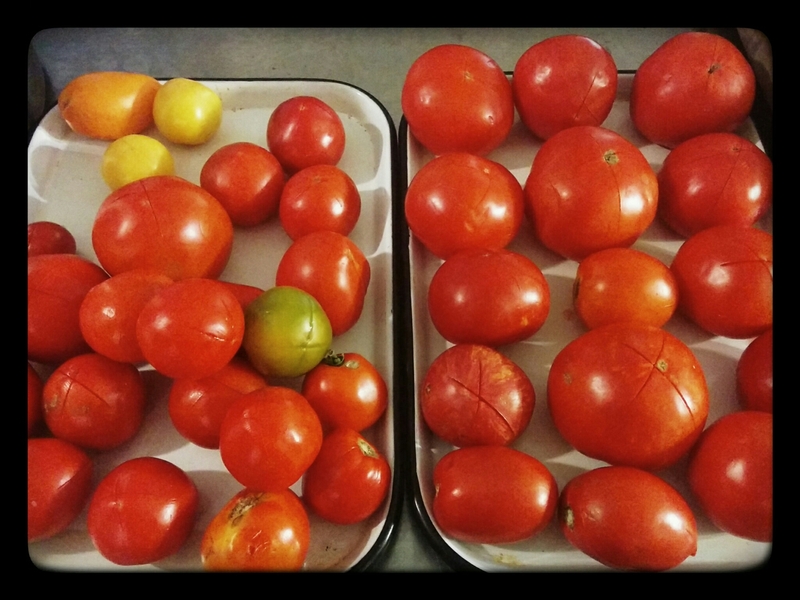 This is my first venture into tomato canning….success! Woo hoo! Keep at it. You can make fire-roasted salsas, plain-old canned tomatoes for future sauces, etc. Ir sure takes up a lot of water, pots and pans! But it’s always such a satisfaction when it’s all over.